We LOVE Ballroom Dancing and we hope you will, too! But- it hasn’t always been that way! Planning our wedding in 1969, Charlie had only one request- NO DANCING! But as the “empty nest” approached, we needed something to do together. In 1990 as our son graduated from high school, we enrolled in an 8 week adult education ballroom dance class at a local high school. Charlie tells everyone “first semester didn’t really count” because he didn’t really want to be there! But by the second time around we were both enjoying dancing- together! After 5 adult ed classes, we continued our study of Ballroom Dance with an additional 2 years of private instruction and another 2 years learning to teach. Our teacher, coach and mentor was the late Lillian Bacine who blessed us with simple teaching methods in the original ballroom styles of the 1930’s and 40’s. While living in south Florida, we were employed for 13 years as Ballroom Dance Instructors for both Palm Beach and Broward County community schools. Our group classes ranged in size from 8 to 65 students and included all ages, preteen to “many years retired”. We have also done entertainment dancing for charites and helped many brides and grooms with their wedding dances. We moved to Central Florida the summer of 2007 to be near our family. 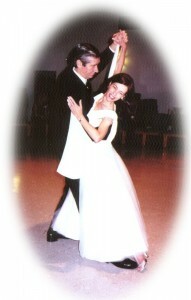 Since then we have enjoyed teaching Social Ballroom in many Lake County communities. We hope to continue to share the joys of Ballroom Dancing with many new friends in our new home.